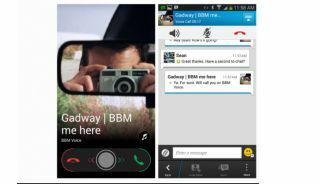 We already knew that free voice calls on BBM for Android and iPhone was coming when BlackBerry's VP Andrew Bocking confirmed it in October, but it looks like we won't be seeing it until early 2014. Along with BBM Voice calls, BBM Channels will also be migrating to iPhone and Android, as well as adding more emoticons and what the company said in a blog post will be "easier file sharing" for pictures, you location and voice messages. The new features are in beta right now, with BlackBerry repeating Bocking's earlier words, saying that a bigger roll out should happen within "the next couple months." No word yet on BBM Video, however, which Bocking said back in October was also coming to the messaging service in "coming months". Once it does however, it will be able to better compete with Apple's iMessage and FaceTime, which started offering free voice calls over an internet connection with the rollout of iOS 7. BBM's chatroom-type feature Channels migrating over to iPhone will also put it in a more profitable position than Apple's native offerings for its own devices, as it will be able to also sell ads and sponsored posts on the platforms.